Only trips of at least one week duration are listed here. Primary source material is a 42-page hand-written record by Joe Firey, prepared in 2006. Additional information has been gathered from The Canadian Alpine Journal (CAJ), The Mountaineer annual (MtneerA), Summit magazine, and Don Serl’s Waddington Guide (Serl-2003). In this summary “FA” means either first ascent or new route. Central Selkirks (Rogers Pass), BC: Glacier Circle cabin, lightning. Central Selkirks, BC: Dawson East Peak, Castor, Pollux, Leda. Central Selkirks, BC: Dawson Main Peak, Augustine, Donkin. Central Selkirks, BC: Sir Donald NW Ridge. Southern Selkirks, BC: Templeman (FA), Abbott, Sir Donald in storm. Northern Selkirks (Fairy Meadows), BC: Austerity, Gothic, Pioneer, Ironman. Northern Selkirks, BC: Gothic, Austerity, Adamant via Stickle Col (FA). Canadian Rockies, AB: Athabaska, Edith Cavell, Robson attempt. Central Selkirks, BC: Sir Donald, Tupper. Northern Pickets, WA: Crooked Thumb, Phantom, Challenger South Ridge (FA). Northern Pickets, WA: Luna, Fury East to West Traverse (FA). Southern Pickets, WA: Terror, Otto Horn (FA), Himmelgeister Horn (FA), Frenzel Spitze (FA). Southern Pickets, WA: Pyramid, Degenhardt Glacier (FA), SE Fury (FA). Northern Selkirks, BC: Austerity, Gothics, Sentinel, Silvertip, Blackfriar South Ridge (FA). Monarch Ice Cap, BC: Geryon (FA), Chilicootin, Tzintli (FA), Crystal Spire (FA), Sciron (FA), Chili (FA); see CAJ-1965 p161. Monarch Ice Cap, BC: Helios (FA), Luna (FA), Horribilis (FA), Second Fiddle (FA); see CAJ-1965 p162. “Clarkachamna Peaks,” AK: “Citadel” (FA), other small peaks (FA) in Neacola Mountains. Monarch Ice Cap, BC: West Jacobsen NW Ridge (FA), Snowside East Ridge (FA), “Genghis” (FA); see CAJ-1967 p21. Monarch Ice Cap, BC: Monarch West Face, Princess, Camelot Spires (FA); see CAJ-1968 p197. Waddington Range (Tiedemann Glacier), BC: Spearman, Waddington Main Peak, Combatant attempt. Southern Pickets, WA: West Twin Needle North Face (FA), East Twin Needle (FA). Southern Pickets, WA: Inspiration, McMillan Spires, Degenhardt. McAllister Creek Traverse, WA: Snowfield, Needle, Klawatti Klaws (FA), Austera Towers (FA), Eldorado; see MtneerA-1972 p43. Goodell Creek Traverse, WA: Chopping Block NE Ridge (FA), Terror SE Ridge (FA), Ghost (FA); see Summit-1971-Apr p18. Ragged Ridge Traverse, WA: Fisher, Repulse (FA); see MtneerA-1972 p51. Waddington Range (Combatant Col), BC: Combatant NNW Ridge (FA), Waddington NW Peak via Angel Glacier (FA), Hickson, Geddes NE Ridge (FA), hiked out via Bifrost Pass, see CAJ-1973 p63 and Serl-2003 p125, p238, p286. Tombstone Mountains, Yukon: McGrew and three other peaks (FA) by Carla, Jim and friends. Bella Coola Mountains, BC: Nyland (FA), The Horn (FA), East and West Arjuna (FA), highest Edwards Peak; see CAJ-1974 p68. Waddington Range (Tellot Glacier), BC: Serra I Ladies Route (FA), Serra III, Claw, Asperity NW Face (FA); see Serl-2003 p305, p339. North Baird Glacier, AK: Several peaks (FAs). Waddington Range (Tellot Glacier), BC: McCormick, Argiewicz North Ridge (FA), Claw, Shand, Tellot, Termination, Dragonback; see Serl-2003 p373. Bacon Creek Traverse, WA: Despair, Bacon, Diobsud Butte (FA). Wind River Range, WY: Fremont buttresses (FA), Ellingwood, Twin Peaks, Woodrow Wilson. Bugaboos, BC: Pigeon, Snowpatch, Bugaboo, Sir Donald (in Selkirks). Waddington Range (Radiant Glacier), BC: Tiedemann, Damocles, Chaos, Unicorn, Satyr South Ridge (FA), Centaur; see CAJ-1980 p81 and Serl-2003 p405. Pantheon Range (Ragnarok Glacier), BC: Pegasus SW Face (FA), Fenris NW Ridge (FA), Thor NW Ridge (FA), Zeus NW Face (FA), several other peaks (FA); see CAJ-1981 p67. Western Pantheon Range, BC: Nemesis Peaks, others (all FA); see CAJ-1982 p41. Starbird Peaks, Purcells, BC: North Star, Gwenalin, Black Fang. Waddington Range (Grennelle Group), BC: Grennelle, Irresistible, Sierra, Fascination. Queen Bess Area, BC: Mantle, Queen Bess, Essex, plus unnamed peak. Waddington Range (Remote Glacier), BC: Dorothy, Broad, Trylon South Face (FA), Skean, Angina SE Face (FA), Triangle SW Ridge (FA), Mt Bell attempt; see CAJ-1986 p58 and Serl-2003 p143-145. 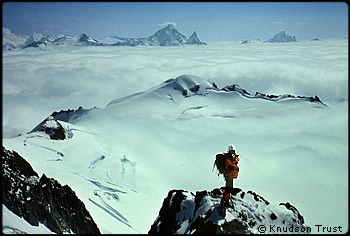 Monarch Ice Cap, BC: Basin Peak, Chili Tower, Cerberus NW Ridge (FA), “Sumquolt Peak” (FA); see CAJ-1987 p82. Waddington Range (Geddes Glacier), BC: Geddes Dogleg Couloir (FA), Privation South Ridge (FA), Chris Spencer North Ridge (FA); see Serl-2003 p124, p129, p156. Monarch Ice Cap, BC: Sciron south side (FA), Crystal Tower North Ridge (FA), Basin Peak; see CAJ-1989 p95. Waddington Range (Bifrost Pass), BC: Whitesaddle Mtn, Delusion South Face (FA), Frontier (FA), Cornelia East Ridge (FA); see CAJ-1990 p61, Serl-2003 p109, p120. Monarch Ice Cap, BC: East Jacobsen, Ogre, Hornet, Mongols. Bella Coola Mountains (West Edwards), BC: two peaks (FA). Bella Coola Mountains (East Edwards), BC: three peaks (FA); see CAJ-1993 p88. Waddington Range (Tellot Glacier), BC: Despair, Hall, McCowan, Heartstone. Bella Coola Mountains (Noomst Creek Glacier), BC: two peaks, Matterhorn attempt. At nearly 79, Joe found that his sense of balance while traversing boulder fields was not too good. “The time had come to hang up the ice axe and take up armchair mountaineering,” he wrote. Only trips of at least one week duration are listed here. Unless otherwise specified, the trips involved tent camping on snow. Primary source material is a 30-page hand-written record by Joe Firey, prepared in 2006. Additional information is available from The Mountaineer annual, 1973, p17.